This pendant represents a standing man of slight proportions, who appears to be holding a small bird. Despite the presence of the bird, his identification is uncertain, as he does not appear to be either a falconer or a deity. His left hand is empty and rests on his hip. He is dressed in a belted outer robe of a thick fabric. This robe has a round collar with central closure and is draped to hang between the legs, over leggings which are stuffed into his high boots with raised toes. The belt has a rectangular central buckle and is shown as relatively wide all round the image, though the striations of the vertical folds over the torso only appear at the front. The sleeves fit the arms tightly and extend only to the wrist, where they terminate in two gathered folds, almost like bracelets. This shows that the convention for over-long sleeves has not been followed in this sculpture. His short hair is parted in the centre of the forehead, and he has no chignon. His facial features are now quite worn, but the shape of the head with broad, square brow and rounded jaw is still evident; the hairline is delineated by a simple groove. 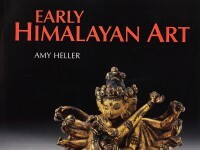 This facial shape somewhat recalls that of Licchavi sculptures of the same period, but his costume is not Nepalese . It is in fact typical of eighth-century Tang China when robes reached to the ankles as seen here, and of figures in mural paintings at Dunhuang during the eighth- to ninth-century Tibetan occupation, which is why a Tibetan provenance is suggested . The loop for suspending the image from a chain is vertical. As the back of the sculpture is quite flat, it would have been ideal for hanging from a chain worn on the body. 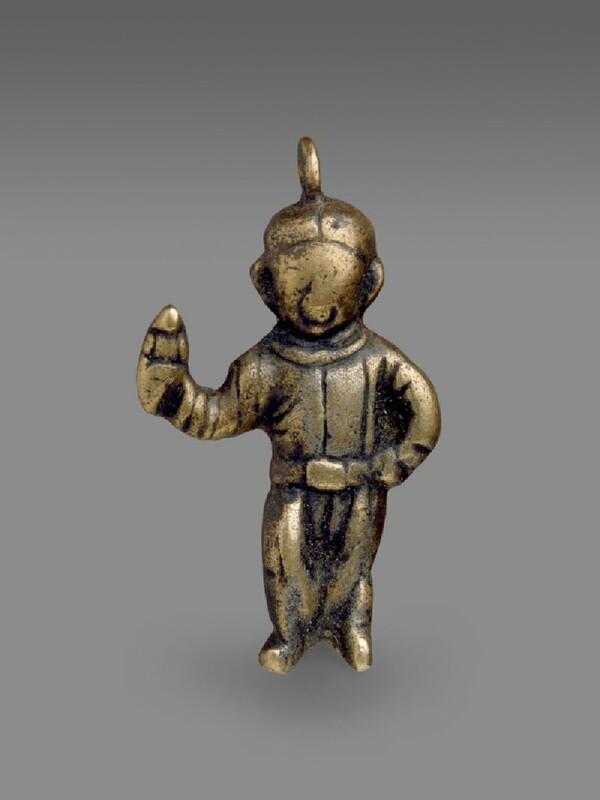 While this appears to have been the function of this talisman, its identification remains elusive. 1 E.g. cat. 6–7 above, for similarly shaped faces on Licchavi sculptures. 2 See Juliano and Lerner, Monks and Merchants, pl. 114, for comparable Tang garments; also Karmay, ‘Tibetan Costume, Seventh to Eleventh Centuries’, and Heller, ‘The Silver Jug’, for similar – though not precisely corresponding – Tibetan garments.